William Brummell had the most unusual background, in that his grandfather had apparently risen to a position of status and wealth by chance and patronage in spite of his very modest beginnings. William also had the distinction of being the older brother of the Regency dandy, ‘Beau Brummell’ (1778-1840). His grandfather, also called William Brummell had been employed as a valet by Charles Monson (the Lincolnshire politician) from the age of 25. Apparently he was ‘a very excellent servant’. By 1748 he had done so well that he was able to marry, set up a home of his own and produced two sons – William (known as ‘Billy’) and Benjamin. He acquired a house on the east corner of Bury Street, and Jermyn Street. His family lived on the ground floor and the apartments above were let out by his wife. By chance, Charles Jenkinson (1729 – 1808), the MP for Cockermouth rented this apartment and, liking William’s son ‘Billy’ obtained a position for him as a clerk in his office when he became Joint Secretary to the Treasury. When Lord North took over the post in 1767 he retained ‘Billy’ as his private secretary, and kept him on when he became Prime Minister in 1770. In the meantime his father William, after thirty years as a ‘faithful and confidential servant’ had retired as a valet at the age of 55 following Charles Monson’s death in 1763 and died in 1770. Billy’s position as Private Secretary to the Prime Minister brought him certain privileges including the entitlement to a grace and favour apartment in Hampton Court Palace; he also received various sinecures which were in the gift of Downing Street which netted him a tidy sum of £2,500 a year. He made a desirable marriage with Miss Jane Richardson, the youngest daughter of the Keeper of the Lottery Office and in 1783, like many of his contemporaries, purchased a country residence at Donington Grove, near Newbury, in Berkshire, whilst keeping a pied-a-terre in Abingdon Street, just behind the Houses of Parliament. He produced three children, Maria, William (born at Donington Grove) and George Bryan (born at No 10 Downing Street). He acquired a number of important friends such as Richard Sheridan(1751-1816) the playwright and politician, author of ‘A School for Scandal’, Richard Tickell (1751-93), the pamphleteer, dramatist, and friend of Sheridan, the Barrister Charles James Fox (1749), and Sir Joshua Reynolds who painted the two curly-haired Brummell boys, who sat for him in 1782, at the same time as he was producing a portrait of Charles Fox. 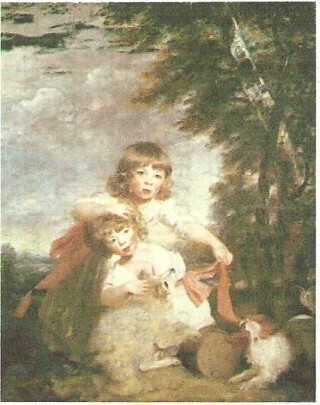 The painting was exhibited at the Royal Academy in 1783. By this time ‘Billy’ had enough money and patronage to be able to send his two sons to Eton; William went in 1788 and George Bryan in 1790. He had also extended his property ownership by acquiring the manor of Speen (adjacent to Donington) in 1784 and the manor of Bradley Court in 1787. With a view to further social advancement he entered into local politics and began to elaborately entertain some of his well-to-do contemporaries. Sheridan and Fox were frequent visitors. He was soon made High Sheriff of Berkshire. Apparently there were streams of visitors to the house which he hoped would help to establish his sons place in ‘rarified’ society. However ‘Billy’ was not impressed by his sons’ progress at school: William at the age of 14 was described as ‘thoughtful’ and ‘a handsome and attractive boy’ but ‘not a very serious student, though with a reasonably acceptable record in deportment’. George Bryan was the livelier of the two but, no doubt influenced by his father’s glamorous friends, was reported as having developed ‘a precocious and worldly air’ by the age of fifteen. The Brummell family were prospering but In 1793 tragedy struck. Their mother, Jane, died and their father died a year and a day after her funeral, leaving the children the considerable fortune of £65,000 to be divided equally between them after the sale of Donington Grove. The children were placed under the guardianship of trustees, and in the same year both boys were sent to Oriel College, matriculating, on 28 May 1794 at the age of seventeen and sixteen respectively. George Bryan immediately left Oxford and enlisted as a cornet in the Tenth Hussars, the Prince of Wales’s own regiment. Beau Brummell’s subsequent fame described as being ‘in everything the arbiter elegantum’ which has been well documented elsewhere was to continue until 1813 when his friendship with the Prince of Wales ended and he was forced to flee the country to escape his gambling debts, ending his life tragically in the asylum of Bon Saveur where he died in his bed on 30 March 1840. Little is known about William Brummell’s life after he left Oxford although Campbell suggests that he had ‘followed in his father’s footsteps by a nice safe sinecure in the civil service’. At some point he joined the local militia and he may have joined the regiment as a cornet like his brother. Certainly he is listed in the ‘Officers of the Berkshire Militia’ as a Captain from 1803-1805. On 7 May 1800 William, cited as being of Donington Grove, married Anne Daniell (1778-1857) of Upper Wimpole Street in the parish of St George, Hanover Street in London. She was the daughter of James Daniell and born in Cuddalore in India. 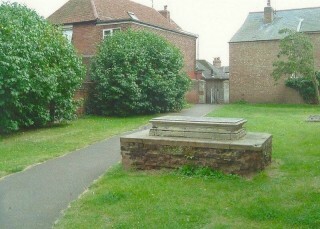 William and Anne had two daughters both born at Donington Grove: Frances Amelia (1801-1862) and Georgiana Ann (1802-1886). In 1811 William purchased Wivenhoe House from the previous owner, Edward Sage in an Indenture dated 14 July 1811. This comprised the mansion built by Captain Daniel Harvey circa 1777 sited approximately to the south of Rebow Road in Wivenhoe and parcels of land further accumulated by Edward Sage to form what became known as the Wivenhoe House Estate. William may have preferred to live a quiet life in the country to avoid the notoriety of his brother’s fame. He was clearly fond of his younger brother Beau (George Bryan) as he refers to him as ‘my dear brother’ in his will of 1816 and makes financial provision for him. It seems that the brothers did have some contact as Gerald Rickword, the local Essex historian, reports in a piece in the local paper that William ‘was fond of clothes but did not indulge in the wild extravagances of the other ……. who used to visit him at the little Colneside town’. William also used to go up to town in spite of his brother’s disparaging remarks about his clothes. On one occasion while Beau was frequenting Whites, the prestigious chocolate club he was reputedly asked – ‘Brummell, your brother William is in town; is he not coming here?’ He is said to have replied ‘Yes, in a day or two; but I have recommended him to walk the back streets till his new clothes come home’. His sister, Maria, in the meantime had married a Captain George Blackshaw, from Chelsea and for some time they lived in a cottage near to Donington Grove although later they lived abroad. Maria was certainly living in Paris in 1814 when George Blackshaw made his will. She was also reputed to have lived in Brussels in 1846 and later Florence. They had four daughters who may have married abroad although at least one of her daughters, Mary Elizabeth Blackshaw was married in Wivenhoe to George Boyd as there is an entry in the parish register to that effect on 10 February 1829, witnessed by William and Anne. William and Anne’s own two daughters made good marriages. Georgina Anne first married Sir Thomas Piggot on 24 October 1831 but, following his demise, married again to John Baillie Baillie. Her sister Frances Amelia married Mathew Dawson Duffield and they were both still living in Wivenhoe according to the 1841 census as was their mother Anne (aged 63) and Georgina Anne’s children, Charles Robert Piggot (6) and Mary Elizabeth Piggot (3). When the Wivenhoe Estate came up for disposal Thomas Harvey stepped in to purchase and handle the dismantling of the Wivenhoe House mansion, and subsequently the division of the estate into 80 plots, and by the mid 1860s the estate was covered in Victorian terraced houses or mariner’s cottages as they were subsequently known. This page was added on 16/01/2016.